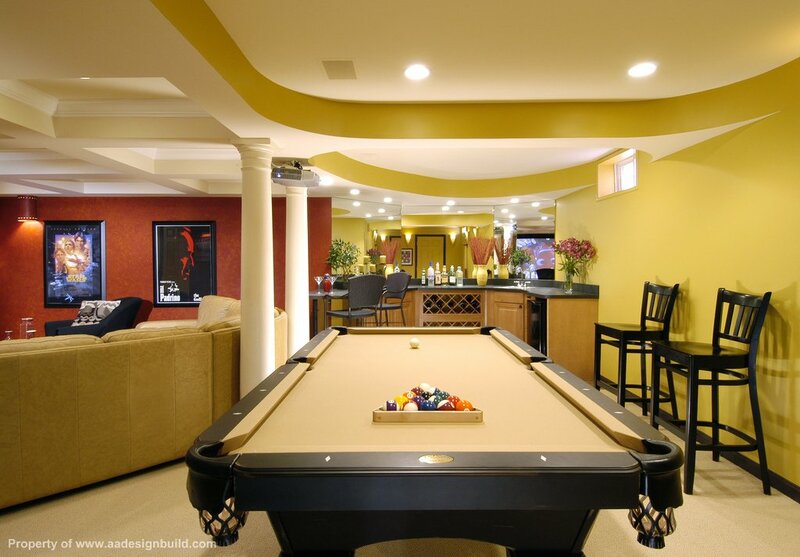 A&A Design Build Remodeling, Inc.
Home remodeling is a maturing industry. That means that truly professional firms that specialize in remodeling are becoming the norm. Now homeowners can draw from a greater pool of reliable remodeling contractors in whom they can have confidence. The shift to more professional remodeling firms, however, necessitates a change in how homeowners should best select a contractor. Specifically, the old practice of collecting three bids for the work and using the low bid to select a contractor no longer makes much sense. In reality, however, such assumptions are dangerous and rarely accurate. Every contractor, professional or not, analyzes a project and estimates costs differently. As a result, the three bids are not apples-to-apples comparisons. Some differences are subtle, but their existence means that bid comparison is deceptive regarding costs. Even if all three contractors based their bids on precisely the same interpretation of the project, the three-bid rule still reduces each remodeler to a number, when the most relevant factors for the owner’s satisfaction are the builder’s skill, experience, personality, record of success, and ability to do the work. For this reason, an increasing number of the best remodeling companies simply refuse to bid competitively, opting out of such opportunities because they know they will be evaluated only in terms of cost, rather than whether they are the best firm for the job. Such remodeling contractors prefer a different approach: the negotiated contract. In that scenario, a remodeling firm is selected based on its abilities and its personality fit with the homeowner. Considering how closely contractors interact with homeowners during a typical remodeling project, these criteria are the best predictors of client satisfaction. The negotiated contract also takes the guesswork out of the project’s cost. In this process, each of two or three contractors receives a budget from the homeowner based on what the homeowner wants to spend, not on what the remodeler thinks the project will cost. Sharing the homeowner’s budget not only removes assumptions and misleading comparisons of cost, but also builds trust and facilitates honest communication about actual costs. If necessary, the builder and homeowner can then negotiate choices and prices in order to match the project’s scope with the client’s budget. Not only does the negotiated contract process result in a more accurate estimate of cost, it is also far superior to the three-bid rule in matching the personalities of the client and the remodeler during the negotiation process. The process also reveals the best match between a particular project and a contractor’s skills and experience. By first narrowing the field, and then by selecting one remodeling firm based on everything except the cost of the project, a homeowner can better ensure that the project will remain on budget and schedule. Both homeowner and contractor are on track for a finished project that meets or exceeds expectations. As the remodeling industry continues to evolve into a recognized profession, it is adopting new and more effective methods of conducting that business. The negotiated contract reflects the new age of home remodeling to the benefit of every homeowner. When contractors and private homeowners consult architects and designers for a building project, the value of a well-designed space is often overlooked. However, a well-designed space can have a significant impact on the occupants of a home, office building, school, or other public space. As discussed in the report, The Value of Good Design, from the UK Commission for Architecture and the Built Environment, numerous statistics show that a well-designed space improves quality of life for all individuals. 1. A well-designed house will have higher real estate value. Homes with well-designed exteriors and interiors have more appeal on the real estate market and often sell quicker and at higher values. A well-designed home will also make you more likely to have guests over and will provide a space where you can relax and escape from outside stress. Living in a well-designed space also increases one’s own feeling of self-worth, since they are living somewhere that has clear value to them and others. 2. A well-designed offices leads to more productive employees. Several studies have shown that businesses that invest in high-quality designs for their buildings will see more success in the long run, mainly because the employees enjoy working in an appealing space. Offices can also be designed in such a way as to increase open communication, organization, and functionality. 3. A well-designed hospital or clinic can have an impact on patients’ recovery time. A study performed by Sheffield University in England found that patients in a newly refurbished ward required less medication and were discharged sooner than patients staying in a ward designed in the 1960s. Another study performed by the University of Nottingham compared various healthcare environments before and after renovation. Improvements such as better views, more space between beds, more lighting, and better seating. The renovations caused patients to have lower heart rates and was perceived as more pleasant by both patients and staff. 4. A well-designed neighborhood has lower crime rates. Well-designed neighborhoods tend to have increased public support for development, higher levels of rent and regeneration. Such areas can also see increased outdoor public activity, especially in neighborhoods that include an intentional shared space like a park. Features such as street lighting and integrated spaces for pedestrians increase the safety of a neighborhood, thus decreasing the crime rate. 5. A well-designed school improves children’s education. Various U.S. studies have found that students test scores improve in well-designed buildings (with other socio-economic factors controlled). Classrooms with more natural lighting, more space, and effective integration of information and communication technology has also been reported to improve students’ performance. Dawn Lovett has worked in engineering for over 20 years. She also owns the site <a href=http://www.onlineengineeringdegrees.org>Online Engineering Degrees</a> for students interested in getting an online degree in engineering. As energy costs rise and the notion of conservation begins to take hold, people are taking the chance when they remodel their homes to increase their water and energy efficiency. It may not pay for the entire remodel, but it is certainly a good way to subsidize the expense, help save the environment and increase the value of your home in one swoop. 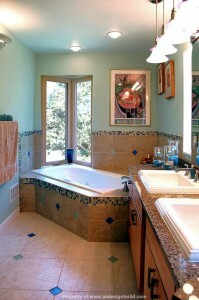 Bathroom updates are the best way to conserve water in 2012 and beyond. If your toilet is from before 1994, then it’s probably a water waster. Update the look of your toilet and reap the benefit of a lower water bill. A new showerhead is also a very quick, easy, and cost-effective way to save on water usage as well as improve your shower experience. The difference between a good showerhead and a bad one is pretty significant. Ceiling fans come in an array of styles, stains, colors, shapes and materials. They are another relatively easy and inexpensive way to update the look of your home. Remote controls can replace the dangling pull chains for a sleeker look and no matter how nice of an area fan you buy—it still looks like clutter. Cut hefty A/C bills in the summer and stave off mustiness with a little circulation instead. Doors and Windows are the biggest energy wasters in the house. Warm air escapes in the winter and invades in the summer. Exorbitant energy bills, even for a 4-bedroom house, are usually the result of a lack of proper barrier between the outside elements and the indoor haven against them. A new front and/or back door can be a great facelift for the façade of your home and this change can increase security and lower energy bills. Windows are in the same boat with doors, especially if you have several. Lisa is a writer on subjects of eco-friendly living, Boston storage, the housing market, remodeling trends, and the Red Sox. 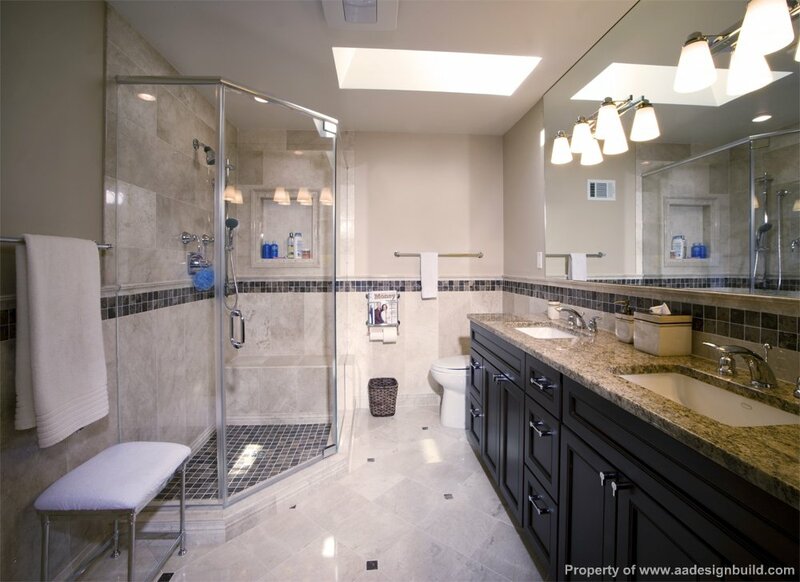 Washington DC, Bethesda, Chevy Chase bathroom remodeling carries one of the highest returns on investment, so it’s a smart way to add value to your property, get more on resale, and give your home a deserving facelift. Knowing how to budget for renovations will help you establish priorities for your project and set reasonable expectations. Bathroom remodeling in Washington DC, Bethesda, Chevy Chase will cost slightly more than in some other parts of the country, such as the south or Midwest. A mid-range remodel costs nearly $15K and will recoup just over 71% of its cost at resale. This type of renovation updates an existing 5-by-7-foot bathroom with all new fixtures, including: porcelain-on-steel tub with ceramic tile surround, temperature and pressure-balanced shower control, standard white toilet, solid-surface vanity counter with integral sink, recessed medicine cabinet with light, ceramic tile floor, and vinyl wallpaper. An upscale version will run around $48.5K and is expected to recoup about 64% of that on resale. Upscale renovations include the expansion of the existing bathroom and relocation of all fixtures. Common features include ceramic-tile shower with body-spray fixtures and frameless glass enclosure, customized whirlpool tub, stone countertop with dual sinks, ceramic tile flooring, custom cabinetry and lighting, HVAC system extension, in-floor heating and heated towel bars. Construction zone: Compare the cost of a general contractor with doing the project on your own. For bathroom remodeling in Washington DC, Bethesda, Chevy Chase this includes the demolition, buying materials, and the time it will take to get permits and oversee the work. If you decide to employ a contractor, be sure to check the company’s experience of successfully delivering similar projects. Labor: In the case of Washington DC, Bethesda, Chevy Chase bathroom remodeling, changing the layout of the room will cost more money than sticking with the original plan. Switch the plumbing, lights, or other fixtures of the bathroom and you’ll drive up costs. However, by making even small layout adjustments, you can have a better looking and more comfortable bathroom. If you must move some things, pick and choose which are most important. Fixtures: It’s tempting to upgrade all of your fixtures to high-end models, but try to compromise. That must-have spa shower is much more affordable if you go with a lower-end sink or toilet. Tiling: There are two costs associated with tiling in bathroom remodeling, especially in Washington DC, Bethesda, Chevy Chase: the tile itself and the amount of labor it takes to install it. Consider using expensive tiles as accent pieces, or limit tile to the tub surround and floor. This will give you the look you want, but at a lower overall cost. Countertops: The choices in modern-day countertops are enormous, which means there are some exquisite materials at affordable prices, too. If you’re smart about it, you can cover a lot of surface for much less than you would be able to do in a larger area of the home, such as the kitchen. Bathroom remodeling in the Washington DC, Bethesda, Chevy Chase area can be a fun and exciting experience, but you must plan for it financially. Be honest with yourself about how much you can spend, arrange your priorities, and then speak with a knowledgeable, Washington DC contractor that can not only design a beautiful bathroom but orchestrate a successful project. It’s no surprise that deer around this area (Chevy Chase, Bethesda, Rockville, Potomac) love to indulge in our abundant gardens and landscaping; clearing out our favorite plants and destroying all of the time and effort we’ve put into our outdoor living environments. In part 1 of this series, we noted how important a short-term plan could be to eradicating deer from your property. This included using plants and flowers that deer tend to ignore, rather than the ones they seem to favor. The next step in achieving a deer-free yard and garden is to follow a long-term plan by integrating a variety of deterrents, which can be switched out during the year to increase your chances of success. Human hair – A natural deer repellent, you can acquire human hair (usually free of charge) from your local barber. Spread some over your flowerbed, and hang some in a sock in your vegetable garden at the row ends or at the outside of rows. Hot pepper spray – Bring one quart of water and a package of dried peppers to just barely boiling, cool to room temperature, strain out the peppers, then fill a spray bottle with the remaining liquid. Use hot pepper spray on any plant you don’t want deer to consume. Just be sure to label the spray bottle! Soap flakes – Sprinkle around the edge of your garden to keep deer away. Noise and light – Repelling deer with deterrents that involve noise and light can work well in combination with other deterrents, such as those listed above. Sensor lights work well at night, and radio noise that is triggered by deer has also been helpful in some cases. Shiny objects, such as metallic strips and CDs hanging from tree branches, can help by reflecting light to make deer uneasy. Man’s best friend – If you don’t already own one, consider getting a medium to large-sized dog. They are natural predators of deer, and can help further by marking the yard every few days. Lastly, it’s important not to feed the deer. While this may seem like an obvious warning, some people don’t realize that giving food to deer – even just once – will have them returning to your yard for more. And if you aren’t there to feed them personally, they’ll find other specimens on the property that will do the job. Remember, deer aren’t picky eaters, so it’s best to employ both the short- and long-term approach to ensure that you can enjoy a peaceful, undisturbed lifestyle. If you’ve been a homeowner in this area (Chevy Chase, Bethesda, Rockville, Potomac) for more than a few years, you’ve probably seen your fair share of deer in the yard. Pretty as they may be, these creatures can do (and may have already done) significant damage to your plants. Even more alarming is the fact they usually carry Lyme disease ticks, a potential threat to you, your family and your pets. 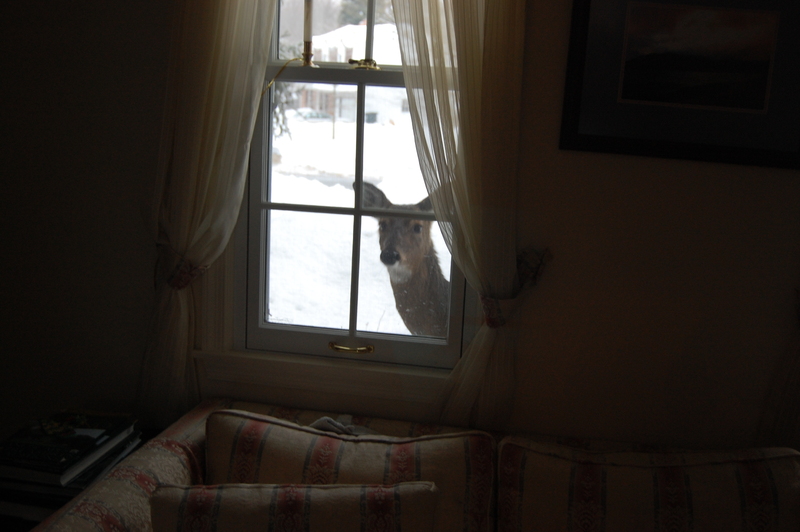 So how can you effectively keep deer away from your yard and garden? Unfortunately, there may not be a surefire way to consistently eliminate them; however, there are a few tricks that can successfully deter these four-legged feeders. Not to mention they can also assist in protecting your landscaping investment. In the short-term, you should consider planting items that deer are less likely to eat. If you’re already missing a few species from your outdoor area, you probably know about some of the plants and flowers that they do like. Some deer favorites include tulips, laurel, forsythia, Japanese yew, crocus and pansies. Luckily, there are many alternatives that deer do not seem to be interested in, which includes: salvia, iris, yucca, English holly, daisies, tiger lilies, wisteria, bougainvillea, yarrow, iris, geraniums, narcissus and dahlias. These are all plants that deer do not particularly care about chewing on. Choose your plants wisely. Even with careful planting, deer will eat almost anything if they are hungry enough. Tomato plants are not typically favored; however, some homeowners in the western states have seen their plants cleaned right off. The best you can do is try different plants and see what works for you. In part 2 of this series, we’ll discuss how you can enhance these results by developing a long-term plan to follow up your gardening efforts. The combination of the two will help you keep your property off deer radar and allow you to enjoy the time and money that you’ve invested in your outdoor environment. As one of our most precious natural resources, water needs to be used conservatively outside the home just as much as inside. There are many aspects of outdoor living that require water, so being smart about using it can ensure that you and your neighbors get what you need. If we’re lucky enough, rainwater provides ample supply to care for our yards and landscaping. Simply set a rain collection barrel under a gutter, and use the water that you acquire to water your plants, lawn or garden. Water the garden and lawn at night. Daytime heat evaporates water, so doing this activity at night gives water more time to soak in. Only water areas that need it, too. Water deeply, less often. This method encourages plants to grow deeper roots, so you can water less frequently. Try a soaker hose, drip irrigation, or micro sprinklers, which eliminate the evaporation of water. Dig furrows and basins. Low areas allow you to water only the roots of plants, requiring less water. Distribute mulch on your garden. Hay, manure, leaves, wood chips, bark, and newspaper are all good choices for mulch, which help plants and trees retain moisture. Grow longer grass, or – better yet – no grass. If you have grass, raise the height of your mower blade or let it grow longer between mowing. If you can, reduce the amount of grass and use plants or ground covers instead, which need much less water. Put plants under big trees. Ideally, plants that thrive in the shade should be placed under big trees to prevent evaporation. Install a timer. Inexpensive timers on your sprinkler and outdoor faucets can control the amount of water used, and help you water at the best times. Choose drought-resistant landscaping. This setup will require less water to remain healthy and attractive. Keep the swimming pool covered. Prevent water evaporation with this simple step, and you can avoid refilling the pool. Switch to environmentally friendly cleansers. By using these types of products indoors, you can reuse wastewater from baths/showers to water the outdoors. Wash the car at a car wash. These facilities use less water, and collect and filter wastewater in a safe manner. As you can see, there are many ways that you can help preserve water supply by being mindful with your outdoor tasks. Employ some or all of these ideas today, and you might even notice your water bill growing smaller.